Many people want more room in their homes. Neglected spaces like basements and attics offer seemingly free space to use for guest bedrooms, kids' bedrooms, or home offices. Often, though, you need to get the basics into shape before you can tackle the real remodeling work. Attics typically do not come with usable flooring. So, flooring your attic is the first step to remodeling an attic. Unless expressly built so, an attic's joists are meant for carrying the load of the ceiling below and related elements, collectively known as the dead load. The ceiling load may include items like drywall, ducts, recessed lights, bathroom fans, and attic insulation. Most houses' attics are built without flooring. However, in some cases, the joists are intentionally built strong enough for the homeowner to later build out the attic. 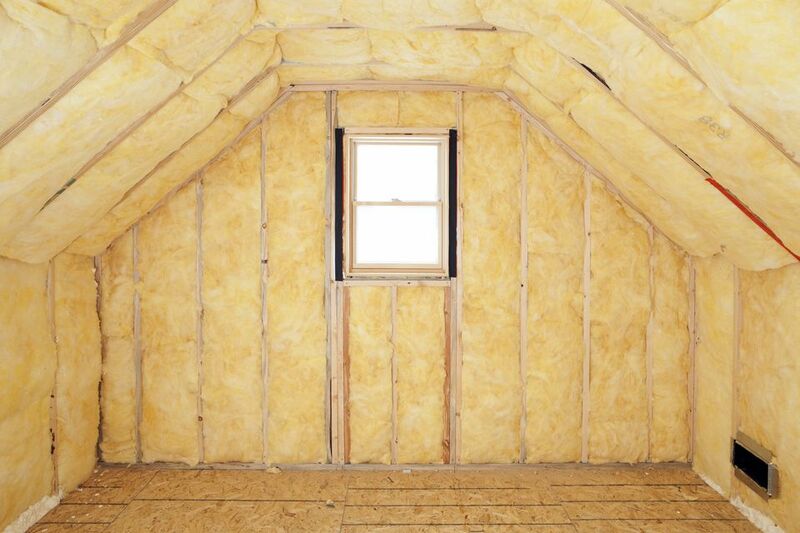 Alternatively, your attic may already have some sort of floor, but this doesn't necessarily mean you can build rooms. Flooring for dead loads may not be sufficient for live loads, or loads created by people and the features of living space. The presence of existing flooring does not ensure that you have a joist system that is substantial enough to support a floor for living space. The previous homeowner may have simply covered the joists with plywood to use the space for storage. While this is not the optimal setup, it is acceptable to have ceiling joists with plywood or OSB on top to use for light attic storage of dead loads. In attics built purely for storage purposes, you may find two-by-six ceiling joists or, in some cases, even two-by-four joists. Attic joists that are made from two-by-eights may be acceptable for building your attic floor, but because every room is variable, there are no absolutes. Joist dimensions are only part of the equation. You also need to ensure that the joist spacing is adequate. In many cases, ceiling joists for dead loads are designed to carry 10 pounds per square foot (psf), as opposed to the 40 or greater psf that live-load joists must carry. Span length is different for every room. So, span length and width between the spans can be determined only by calculations. It is safe to say, though, that two-by-six ceiling joists spaced every 24 inches on-center (a typical arrangement found in attics) will not support live loads for a bedroom, office, or bathroom. The best way to get your span calculations correct is to hire a structural engineer or contractor to run the numbers for you. In many cases, engineers will work on a per-hour basis, making this an affordable option. However, you can obtain a relative idea of your span options for attic joists by consulting any number of online span calculators. One good reference is Washington State University's Maximum Span Calculator for Joists and Rafters, which allows you to enter factors such as wood species, size, grade, and deflection limit in order to calculate spans for both live and dead loads. For example, with such a calculator, you will find that for a 15-foot span, you need two-by-10 Douglas fir heart joists spaced every 16 inches. While not the ultimate voice in spans, these calculators do provide a reality check. Joists you may have thought adequate for your attic floor may not come close. If the attic joists are not adequate, one way to strengthen the floor for live loads is to sister the old joists. Sistering is the process of adding a new joist next to each existing joist. In the case of two-by-six joists, you would pair them up with other two-by-six joists by nailing them together, side by side. The best-case scenario is to run the sisters the entire length of the existing joists so that you have two additional resting points. Pull out all insulation and any debris from all of the joist spaces so you can see the full length of each joist, including where it meets the exterior walls. Also remove any blocking or bridging between the joists, as applicable. Measure the length of the old joists and note how much they overhang any supporting walls or beams and the exterior walls. The top corners at the outside ends of the joists may be cut at an angle to fit under the roof decking. Cut new joist lumber for each of the sister joists, using a circular saw. Check each joist for crowning (slight bowing along the length of the board) and mark the top edge to ensure that the joist is installed with the crown facing up. Fit each new joist in place next to an old joist so their faces make full contact and their top edges are flush. Nail the sister to its mating joist with 10d common nails. Also, nail each sister to the top of the exterior wall and any supporting walls or beams. Cut and install lumber blocking or bridging between the joists, if required by local code. Once the structure has passed the building inspection, you can run electrical, plumbing, and mechanical lines and insulation, as applicable, then install plywood subflooring.